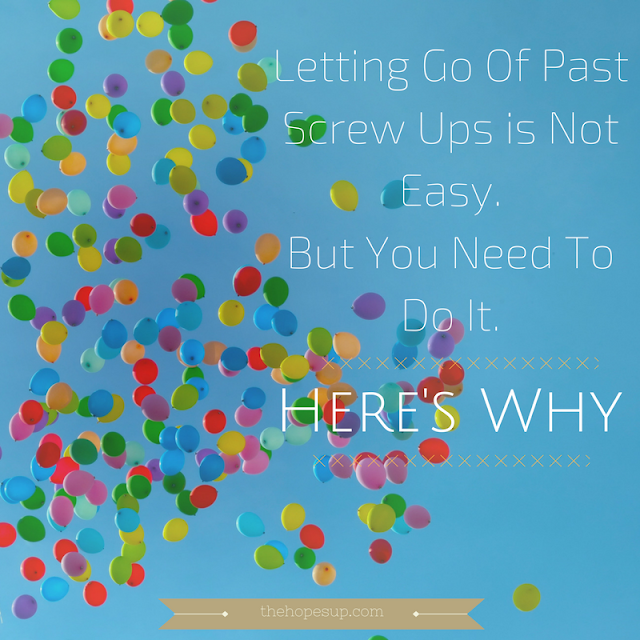 Letting Go Of Past Screw Ups is Not Easy. But You Need To Do It. Here’s Why. There are certain screw-ups in our lives that we just can’t simply forget. They pop up in our head every now and then, reminding us of our worst days. And it isn’t always just that one thought; it starts a chain, reminding us of every mistake we have done in our life. They ruin our mood and make us restless. Although we can’t change the past and undo our mistakes, we can choose to make active efforts to clear our mind from these bad thoughts that make us feel miserable and stop us from moving forward. 1. Everything changes and everyone eventually moves on. People, circumstances…life. Nothing is constant. Things change faster than you imagine. Don’t worry about being judged by other people. If you have sincerely worked on amending your mistakes, you’ll be fine. You can’t predict anything nor can you control anything or anyone else except yourself. Clearly, ask yourself what you really want to become and always keep that image in your mind. Work on creating a mindset that pushes you towards your goals. Dwelling on your past mistakes stops you from moving forward. If you remain stuck in your past, you will not be able to fully work on your present and be held back. Don’t put yourself in jail of your own thoughts. Forgive yourself and move ahead. 2. You are missing out on opportunities to change things. If you constantly focus on your screw ups and dwell on how much embarrassment it caused you, you will not be able to see the ways in which you can improve yourself. Free your mind. Allow yourself to make little changes in yourself which will make it easier to let go of past screw ups. Life is full of opportunities. Your mistake was an opportunity to learn a new and different lesson. You got your lesson. Now move on to finding opportunities to improve yourself. Don’t forget that you still have many opportunities to start over. 3. You are slowing your growth. When you constantly remind yourself of your mistakes, you are training your brain to be more negative. As a result, you can’t focus on bettering yourself and you can’t allow yourself to move on completely. Don't stay in the stagnant stage. Our mistakes and the unpleasant situations we face in our lives slow us down. If you keep yourself in that state, you will not be able to evolve and achieve your goals. No matter how hard it might seem, pick yourself up and strive to grow. By constantly looking back, you are stopping yourself from reaching your full potential. 4. You are unnecessarily upsetting yourself. Thinking continuously about our past mistakes make us angry, sad and guilty. When you keep thinking about it, again and again, you are constantly inflicting yourself with unnecessary pain, which is of no use now. Provided that you learned your lesson from your past mistakes and made up your mind to not commit those mistakes again and move forward, you don’t need to punish yourself by reminding yourself all those past mistakes that make you feel miserable. 5. You are not fully living in the present moment. If you always keep focusing on the times you were miserable, when you look back at your life, all you can remember is the screw ups. You’re perpetuating the effects of something that has already happened. Done. Finish. The nightmare is over. So what you screwed up a few times. We all do! That’s just life. I don’t think there is anyone out there who hasn’t made a mistake. The important thing is to keep trying to get past all the screw ups and see the bright things in life. The important moment is NOW. When you made a mistake, you learned a lesson. And now you can use it to become a much better person than you were yesterday. There are times when you just want to wipe out the bad memories from your mind. Although it’s not possible to entirely remove a bad memory just when you feel like, continuously focusing on the good things in your life will make it easier to move on. As you would agree, times goes by really fast. Years go by so quickly that we don’t even realize it. So don’t waste all of your valuable time continuously whining about your past mistakes. When you realize you have made a mistake, acknowledge it, make the required amends, take the lesson and move on. Period. No beating up yourself for something that is already behind you. I understand that it’s hard to let go of those memories that bothered you for so long, but with continuous efforts, you will surely be able to get past your mistakes. So what are your strategies for dealing with past screw-ups? Share with me in the comments below. Liked this article? Don't forget to share it with others. "If you have sincerely worked on amending your mistakes, you’ll be fine." I needed to hear this so badly. Thank you for this entry; it found me at exactly the right time. We do our part by correcting our mistakes, we can't control or decide other people's response to that situation. I'm glad this post helped you. Keep growing and stay happy! When you constantly remind yourself of your mistakes, you are training your brain to be more negative. I love that line. And I am still struggling to forget my past. Thanks for sharing! It is a great reminder to me. I totally understand your struggle, it is hard to let go of all the awful memories, but with time and active efforts you'll be able to move on completely. Thank you so much for stopping by! These are very wise words! I went to a counselor once, and he said that living in the past causes depression, and thinking too much about the future produces anxiety, so live in the present, and be at peace. And you are right, time goes by so fast! !